You are currently browsing the category archive for the ‘Supreme Court Clerks’ category. It is appropriate that I should be posting this on Canada Day, because it is about our recent visit to this nation’s capital. Canadians are not known for their patriotic fervor, but on this particular day they revel in whatever feelings they may have for this vast land mass they call a country. 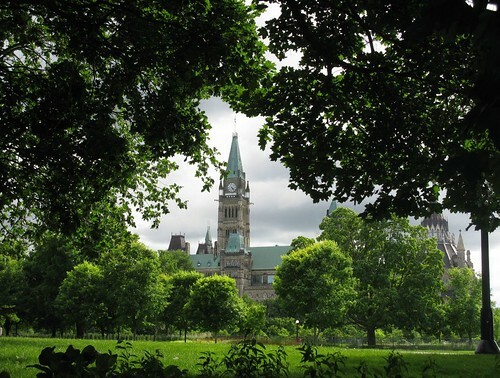 Many years ago I was in Ottawa on July 1. The fireworks were spectacular. Once upon a time (this will be hard to believe for any readers under thirty) there were no personal computers. Every single written communication of any kind had to be written out by hand or punched out on a reluctant piece of machinery called a typewriter. All mistakes had to be corrected with something called white out. This is within living memory, within my lifetime as a grown up. Way back BBG (before Bill Gates) and BSJ (Steve Jobs) my wife was selected to be a clerk at the Supreme Court of Canada. That year, there were ten clerks. The Chief Justice had two; the others had to make do with one. Most clerks worked like galley slaves just to keep up. This was BBG, remember. The judge my wife worked for was smart, hard-working, very diligent and exacting. He left a legacy at the Court that people still talk about; he is regarded as one of the best judges the court ever had. My wife admired him, but he was not an easy boss. Ever in search of the perfect clerk, the judge would always choose someone completely different from the previous worker bee. We know this because of the reunions that were held at his estate on his birthday every year until he retired. The assembled individuals seemed to belong to the same species, but that was about it. Aside from brains, a willingness to work very hard and a good legal education, they had little else in common. Every five years there is a reunion of clerks for the entire court. I had never been to one before, but this year we not far away and I had my good suit. It seemed like the perfect opportunity to put in an appearance. We could catch up with my brother-in-law, see a good friend who lives and works in Ottawa, and hobnob with the high and mighty. Now that each judge has three clerks, the numbers have ballooned. The atrium of the Supreme Court itself was large enough for the cocktail party, but seating six or seven hundred for dinner requires a very special venue. Capital cities are not my favorite places. They tend to attract people who like power, as well as multitudes of civil servants, interns and secretaries. I spent one summer in Ottawa and three years in Washington D.C. I found both cities excruciatingly dull. In Ottawa, at least, it is easy to get out into some lovely country very quickly, and a handful of the buildings are beautiful. The architecture of The Parliament Buildings, the National Gallery and the Canadian Museum of Civilization are worth a trip to the city. I can’t say the same for the exterior of the new War Museum. but it does have room for a sit-down dinner for seven hundred. As long as you don’t mind tanks. I had never thought of Canada as being a particularly militaristic country, but for many years this country was part of Britain, and the same cannot be said of the U.K. There were the never ending wars between England and France that finally came to a head on the Plains of Abraham. In one half hour battle, years of warfare in North America was finally resolved. Then there was the Boer War, the War of 1812, the horrendous trench warfare of World War I, the battles in France, Italy and Africa of WW II. Canadians paid a huge price for their European heritage. And then all the Peacekeeping, which is another form of war. And now, Afghanistan. Our venue for the grand evening of the reunion was an extraordinary space. 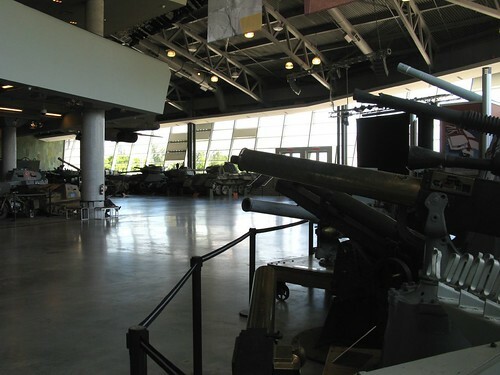 It was a cavernous room of concrete and glass, big enough to hold a full-size fighter plane overhead and a football field of tanks. And not just tanks, field artillery and armored vehicles of very description. What made this disconcerting was that all the enormous guns were pointed directly at us. If I hadn’t had my Brioni, 007 suit on, I might have considered a quiet exit, but the discrete flak jacket sewn inside comes in handy on just these kinds of occasions. What with the interesting company, the food, the wine and the extraordinarily injudicious entertainment, we had a very good time indeed.